The old is new again! And just as before it promises better quality of life and overall health for everyone. Bone broth has become popular (again) both for its health benefits and in fine dining too. It not only adds flavor and character to food, but also is chock-full of valuable nutrients. These nutrients not only taste good, but also improve digestion, support the immune system, provide relief for sore muscles and achy joints, and restore and maintain overall health. When did we first eat bone broth? Making bone broth isn’t new. It goes back thousands of years. When people first started cooking, they used all parts of the rare animal for their nourishment. And bone broth does just that. And it’s been a staple of the human diet ever since then. 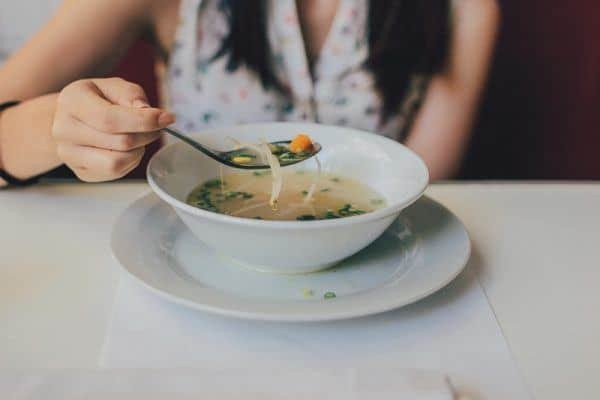 Nowadays, with our trend toward a more and more processed diet, the “good ole” bone broth often is forgotten, with negative consequences for our health and well-being. In my opinion, and that of many other experts, bone broth belongs in every human’s diet. Bone broth is made by boiling and slow simmering connective tissue and bones stripped of their meat (sometimes with herbs, seasonings and vegetables) for anywhere from 6 to 18 hours or longer. The bones and tissue typically come from chicken, fish or livestock such as cow or lamb. It remains an important part of the diet for people around the world and is a “secret ingredient” in many delicious dishes, called “stock”. Bone broth, if made correctly, will gel when cooled and has a thicker consistency than store-bought “broth”, which often contains harmful additives and flavor “enhancers”. We don’t need all those when we make our bone broth ourselves. Click HERE or the button below for my recipe for bone broth made in the slowcooker. It couldn’t be easier. "Leaky gut" describes a condition where gaps open in the lining of the intestines that allow undigested foods, dangerous toxins, germs, harmful bacteria and other pathogens to pass into the blood stream. Once in the blood, they trigger an immune response. Research suggests restoring the integrity of the intestinal lining (reversing a leaky gut) can help reduce the occurrence of autoimmune diseases, allergies and more. One of the main ingredients in bone broth, gelatin (another name for collagen broth) has been recommended for hundreds of years to soothe digestion. Doctors ages ago would recommend a broth of gelatin to treat all kinds of illnesses where the stomach or skin was involved. These days, researchers have found that gelatin protects the inner lining of the intestines, making it helpful for leaky gut and many ailments potentially caused by leaky gut. Bone broth works very well for joint pain, which may seem surprising. The reason is that the gelatin soothes the digestive tract while other nutrients nutrients like proline, glycine, sulfur and silicon as well as trace and structural minerals from the bone broth provide the nutrients needed to repair and heal joints. What can give you a “leaky gut”? Many factors can lead to a disturbance in the gut microbiome and thus to a leaky gut. These include a standard American diet (SAD) full of processed foods, food additives, pesticides and herbicides that damage the lining of the gut. Chronic stress also has been proven to disturb the gut bacteria and lead to a leaky gut, as well as many medications, like antibiotics, but also infections, traveler's diarrhea, and more. If you suspect you have leaky gut, start by making bone broth and drinking it daily, as a drink or add fresh vegetables and pastured or grass-fed meat and spices for a delicious soup. If your symptoms persist, you may want to schedule a free and confidential phone consultation with me to find out how to resolve your individual issues and get back to health. Click HERE for FREE Healing Compass Call!and Start Your Path to Your Best Health Today! Previous Post Depression Symptoms: 7 Signs That You May Be Depressed! Next Post Social and Emotional Intelligence – What is it Good for?